The Smurfit Kappa Group owns an art collection that dates back to the 1970s. 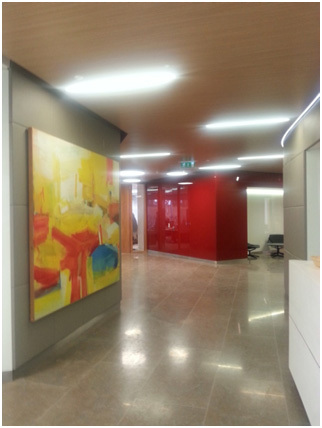 The recent restoration of their iconic headquarter building in Clonskeagh provided an opportunity to display these artworks in the newly designed interiors. Working with Henry J Lyons architects, Murphy compiled an inventory of over 300 artworks and designed layouts for their display in the newly fitted out building, this involved labelling, reframing, hanging, and installation. This was a particularly challenging job because of the tight timeframe to undertake the work.